I was really excited to receive the hair treatment and Elixir oil. I'm a huge hair oil addict when it comes to using products like this as I'm a bottled Blondie and also use heat styling tools. 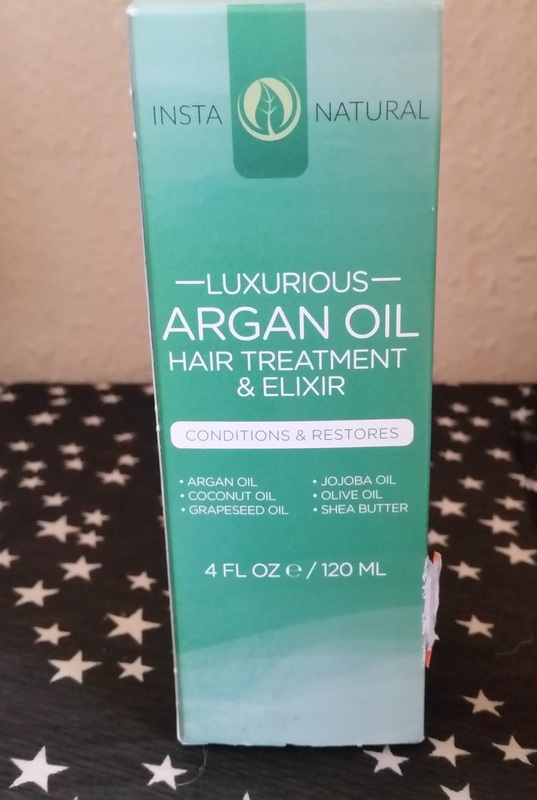 I'm always on the lookout for products that claim to help restore and help hair look healthy because lets face it everyone wants there hair to look good! 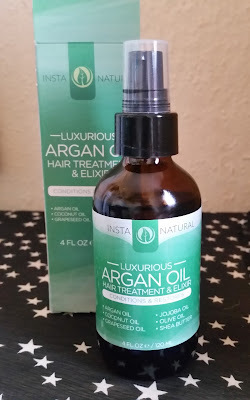 The Argan Oil Hair Treatment comes in a green box and states CONDITIONS AND RESTORES. The size of the bottle is 4 FL OZ / 120 ML which is a great size for this worthy hair product. Inside the packaging, the product comes in a glass bottle with a pump dispenser which dispenses just the right amount u need to use. InstaNaturals Argan Oil Hair Treatment and Elixir revitalises weak, limp and lifeless hair. Our unique formula contains 100% buttery rich plant oils that penetrate the hair fiber and rehydrate the dry scales of hair cuticles. In addiction, Panthenol strengthens the hair shafts by filling in the cracks and shea butter thickens the hair to add volume. ten minute, two hour, or overnight hair repair treatment. Apply as much as needed. Shampoo after treatment. Rub a drop of it between your palms and smooth or scrunch into hair as a styling aid and healing Elixir. This product is great! 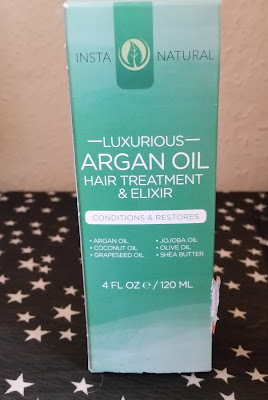 I have used loads of oils and Argan oils in my time and this is for sure one of the better ones! OLIVE OIL, GRAPESEED OIL AND SHEA BUTTER. I used this as an over night treatment and applied to my hair in sections. This oil is clear and doesn't have a scent which i don't mind if I'm being honest. As soon as this is applied it absorbs instantly into the hair and gets to work moisturising and rehydrating! You instantly have a shine to your hair without having to use a ton of different products. My hair felt so soft and smooth and the next morning my hair was like someone Else's. The frizz that my hair had, has been banished and my hair health is improving every time i use this. This for sure is a hair saviour! if you have been over doing the heat styling tools or have had a colouring, then this treatment works! I would for sure highly recommend this worthy hair treatment!